I spent all of the 2013-14 basketball season thinking the Boston Celtics were poised to make a big splash this summer. It was a strange season, the first since 2006-07 that the C’s weren’t a playoff team, let alone a legitimate championship contender, and I thought it wouldn’t be long before they would be back in the mix. Instead, they fell to #6 in the draft lottery, and did not have enough assets to acquire Kevin Love from the Minnesota Timberwolves, who was traded to the Cleveland Cavaliers this week in exchange for 2014 #1 overall pick Andrew Wiggins and 2013 #1 overall pick Anthony Bennett. It might be a while before the Celtics can compete with Cleveland, Chicago, and the best teams of the West again, but it’s not all bad. There were no fireworks this summer in the way that Celtics owner Wyc Grousbeck had hoped for during the season, but there were quite a few mildly exciting things that happened for the team. First off, the Celtics unveiled a new alternate logo, pictured in the top left corner of this article. The new logo is a sleeker, cleaner take on the classic Lucky the Leprechaun design that was first drawn up by Red Auerbach’s brother. 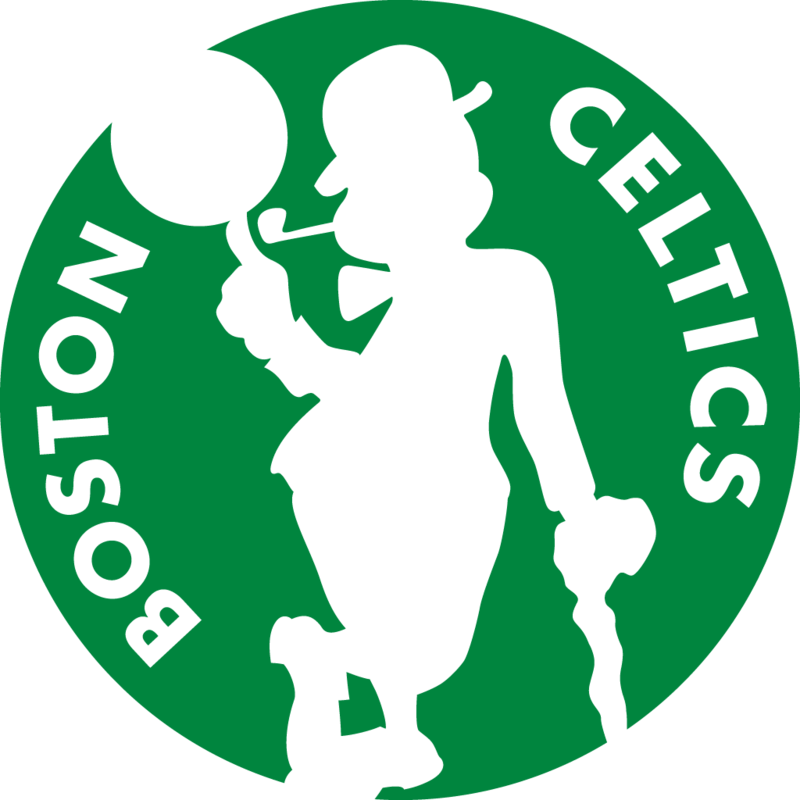 It looks a little a lot cartoonish, and I’m thinking of referring to it as the “Bugs Bunny Celtics Logo” in future blog posts, but many of the best logos in sports are shamelessly cartoonish. That’s another article for another day. 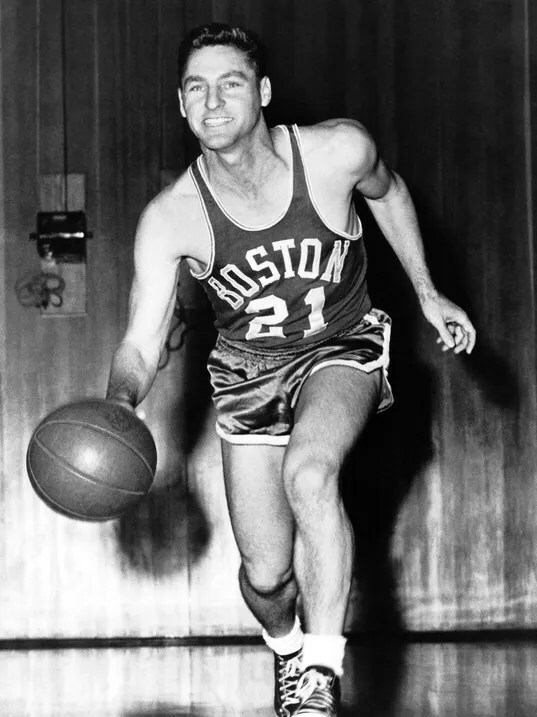 The other big uniform change the Celtics are making this year is that the road green jerseys will now say “BOSTON” instead of “CELTICS” like they did back in the 50s and early 60s. Again, I’m a big fan of the change. The Celtics have the best uniforms in the NBA in my opinion, and the great thing about that organization is that if they ever want to retool their look, they can just borrow from the past. Many teams in all four sports continue to change their color schemes and completely overhaul their logos, but the Celtics will never need to do that. Their identity is secure. Another exciting thing to happen off the court for the Celtics this summer was Brian Scalabrine’s homecoming announcement. While the parody of LeBron James’ Sports Illustrated article is funny enough in and of itself, the fact that White Mamba is returning to the Celtics is welcome news. 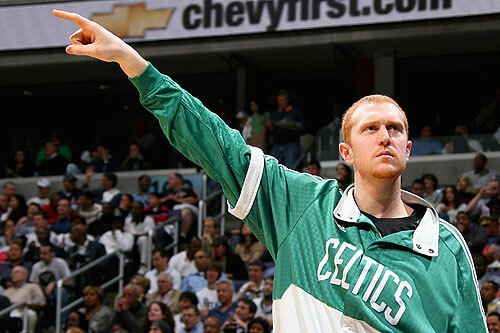 Scal belongs in Boston. Even if he’s just a broadcaster (and filling the shoes of Celtics legend and color commentator Tommy “That is bogus!! !” Heinsohn during road games) for CSSNE, it’s great to see him as part of the Celtics family once again. Scalabrine was a fan favorite during the New Big Three Era where he carved out a role as the big redheaded guy in the huddle and the last guy on the bench, draining threes in games that Paul Pierce, Ray Allen, and Kevin Garnett had already put away. After the C’s devastating seven game defeat at the hands of the Lakers in 2010, Scal signed with the Chicago Bulls, joining former Celtics assistant coach Tom Thibodeau, who had been hired as Chicago’s new head coach. He played a couple more seasons in the same role he had in Boston, but in a show that starred Derrick Rose and Joakim Noah instead of Pierce, Allen, and KG. This past season, he served as an assistant coach under Mark Jackson for the Golden State Warriors, but was reassigned towards the end of the season. After another early playoff exit, the Warriors fired Jackson and overhauled the basketball operation for the new coach Steve Kerr. When it became apparent that Scalabrine would be looking for work, and that the Celtics might not be able to accomplish as much as they were hoping this summer, the guys from the Toucher and Rich show on 98.5 The Sports Hub decided to write a song to raise awareness and get Danny Ainge’s attention. Whether that song helped the cause or not, Brian Scalabrine is a Celtic again, and the world is better for it. As for the changes the Celtics have made on the court, I think they drafted as well as they could with the #6 and #17 picks, acquiring Marcus Smart from Oklahoma State and James Young from Kentucky. They also signed former #2 overall pick Evan Turner, who played for the Philadelphia 76ers and Indiana Pacers last season. Those are three young players who still have plenty of upside. It will be interesting to see who stays in the Celtics’ long term plans among the “gluttony of guards” as Cedric Maxwell called on the night of the NBA Draft. Between Rajon Rondo, Avery Bradley (who signed a four year deal this summer to stay in Boston), Smart, Young, Turner, and Phil Pressey, that’s a lot of small talent. The Celtics still have Kelly Olynyk, Jared Sullinger, Jeff Green, and Brandon Bass coming back for forwards, as well. Sullinger showed us a lot in his second year, after being limited by a season ending back injury and the limited amount of minutes Doc Rivers gave to young players as a rookie. Olynyk had a strong finish to his rookie season, finding a bit of a scoring touch by season’s end, and hopefully he can build upon that in 2014-15. Head coach Brad Stevens has a better roster to work with than he did his first year with the Celtics, and now the questions surrounding the Celtics should be less about draft position and more about playoff position. The Eastern Conference is not very good. There is a reason the Miami Heat represented the East in the NBA Finals four straight years, and it’s not just because of LeBron James. There are a couple of very good teams. The past couple years, it was the Heat and the Indiana Pacers, but with LeBron’s return to Cleveland, and Indiana’s loss of Lance Stephenson in free agency to the Charlotte Hornets (yes, they’re the Hornets again!) and the loss of Paul George to a devastating injury in a meaningless game, it’ll be different teams this time around, in all likelihood. The Chicago Bulls look poised to take the East by storm, with a healthy Derrick Rose coming back, the reigning Defensive Player of the Year in the form of Joakim Noah, and the signing of veteran star Pau Gasol. The Washington Wizards, having signed free agent ex-Celtics Kris Humphries and Paul Pierce to go with a pretty good young core headlined by John Wall and Bradley Beal, could be another legit contender from the East, but after that, it’s wide open…especially in the Atlantic Division. The Toronto Raptors finally broke through and made the playoffs last year, but lost to the Brooklyn Nets in the first round. They were the beneficiaries of being in a weak division in a year with six or seven highly intriguing draft prospects, so they won the division by default. 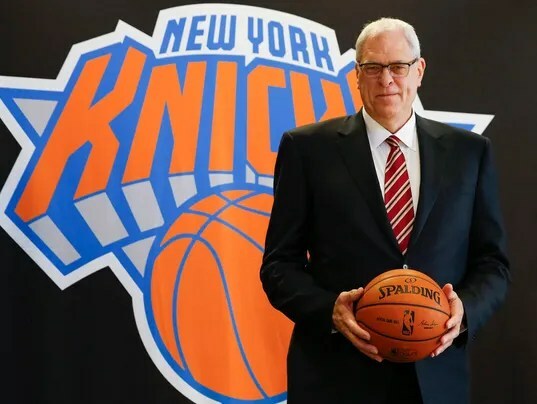 The New York Knicks are the New York Knicks, and not even Phil Jackson can change that. They’re going to keep trying to do their thing, and they’re going to hold out hope that the bright lights of New York and the mystique of Madison Square Garden and the star power of Carmelo Anthony will be enough to lure Kevin Durant to them. As always, they’re the Knicks, so they’ll find a way (or multiple ways) to mess that up. The Philadelphia 76ers are blatantly tanking for a top five pick in the NBA Draft…again. This is their new thing: lose as much as possible, draft a guy who is hurt and won’t be able to play for a year (Nerlens Noel in 2013, Joel Embiid in 2014), lose some more, get another high pick, and repeat the process until the entire roster is loaded with potential. Wake me up when they start trying. With Coach Stevens, and the assemblage of talent already on the roster, the Celtics have as good a chance as anyone to make the playoffs. Once they’re there, the probably won’t win it all, but they can at least make it interesting. In Adam Silver’s NBA, the playoffs have already become less formulaic than they were for 30 years under David Stern, and maybe, just maybe, anything is possible. ANYTHING IS POSSIBLE!!!!!!!!!!!!!!!!!!!! We’ll just have to wait and see what that anything will be.